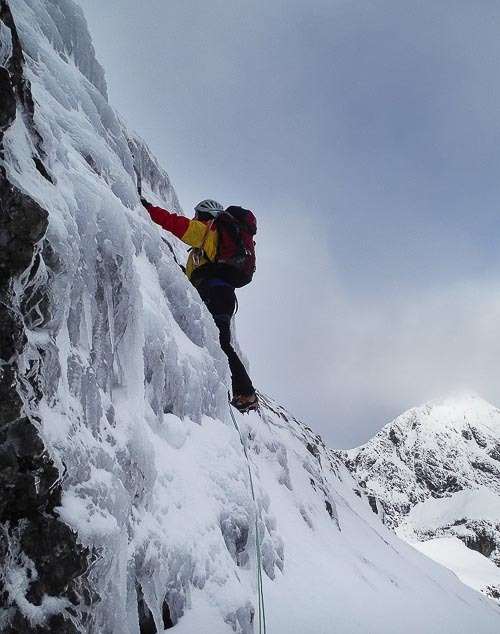 “For many years in the 1990s whilst taking clients up the Inaccessible Pinnacle, I always wondered what was down the Coruisg side,” Andy Nisbet writes. “The Brittle side has hoards wandering up and down, but no one goes to the Coruisg side where a convex scree slope leads down to unseen crag. Over the subsequent years, I tried hard to see what was down there but the curve of the Cuillin ridge was always wrong for getting even a peek. Last week, Sandy Allan was free for a couple of days with the limitation that he was giving a talk in Portree on the Wednesday evening (February 24). So realistically we would have to climb in Skye. Mike Lates always lobbies hard to bring Skye to everyone’s attention, and as his reports reached a crescendo of enthusiasm, a normally sceptical Andy decided there might be some truth in them. So I took Sandy up on his offer and we arrived in Skye with two cars so we could sleep in them and get an early start, needing to be down shortly after lunch for Sandy to set up his talk. There was a distant picture in the new Skye guidebook which indicated the face was not unreasonably steep, so we ought to be down in time. The guidebook indicated you could approach either by scrambling down under An Stac or from Bealach Coire na Banachdich. I assumed the former might need some abseiling so we took the longer but safer second option. Also, I had been that way before for O’Brian and Julian’s Route, so I knew it worked. And we would be using Sandy’s new twin 6.8mm(!) ropes, so sacks would be light. Not that they felt it. As we descended from the col under the face, it became obvious that Mike had been telling the truth and there really was a lot of ice. As we traversed under the main face, our line suddenly appeared as a wide swathe of thick ice. There are days when you know you’ve struck lucky. It even looked straightforward and we set off soloing. But of course ice is usually steeper than it looks so soon the ropes came out; it would have been a shame not to try out the new thin ropes. I led out a full rope length of ice with the top quite steep. It felt like 60m but apparently the ropes were only 50s. After a snow terrace, another full rope length of ice led to upper slopes of solid neve and we soloed up to the sunshine beside the In Pinn. This entry was posted in New Routes and tagged Andy Nisbet, Sandy Allan, The Cuillin. Bookmark the permalink.